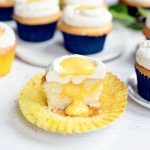 Stuffed mango cupcakes filled with mango curd and topped with mango buttercream are a fun party recipe. 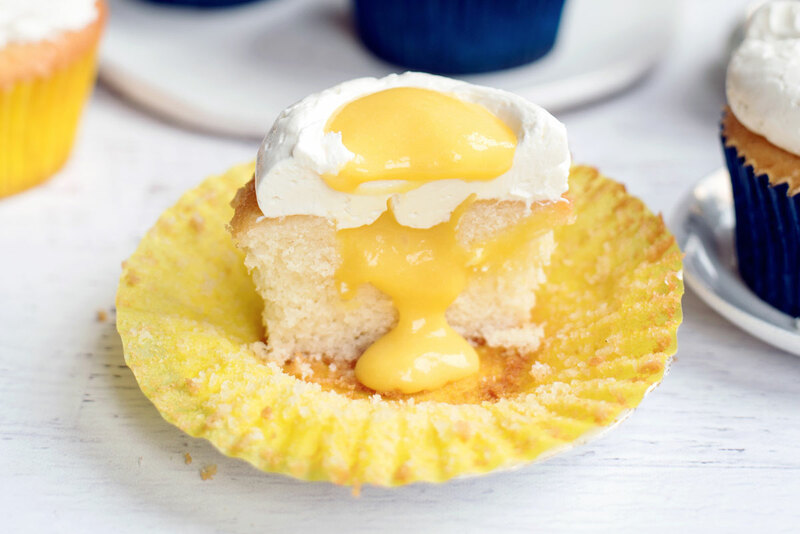 These trompe l’oeil desserts look like sunny side up eggs! It’s my birthday this weekend! The big 3-1 (said no one ever). Last year, when I turned 30, I was asking all kinds of important life questions. Like, should I cut my hair? Can I still wear black leggings? Spoiler alert, I’m wearing black leggings as I type this, so I guess that question answered itself. This year, I’m approaching my next trip around the sun with gratitude. There have been a lot of studies about the impact of gratitude on health, and unequivocally they tell us it’s important. People with a gratitude practice are happier and healthier. Every morning and several times a day I take a few seconds to pause and think about what I have to be grateful for. There are so many things. I have the love of a partner who is also my best friend and who makes the best adventure partner ever. I have my health and the ability to push myself physically with things like running and pilates. I live in an amazing city and have a great group of creative and smart girlfriends. I also have this corner of the internet which I am so passionate about. My love for creating new content and connecting with all of you here absolutely drives everything I do. It pushes me to wake up before dawn and spend every spare moment on it. It’s the first thing I think about when I wake up and the last thing I think about before I go to bed (other than a smooch for Pat!). I’m also grateful for the ability to make sweet things to share with my loved ones and all of you. 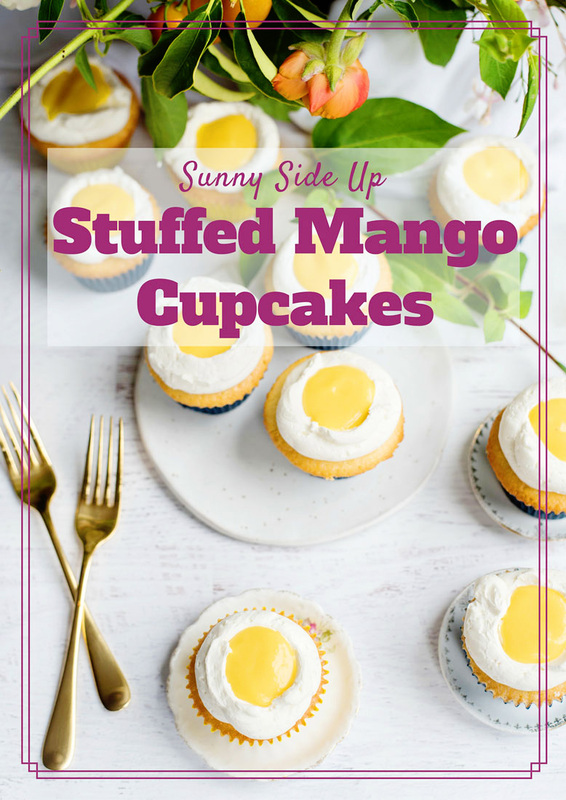 Take these stuffed mango cupcakes, for example. They are made with mango curd and a mango buttercream. It’s a subtle mango, which was what I was going for. If you want something that is stronger and uses mango puree, just do a quick google search. 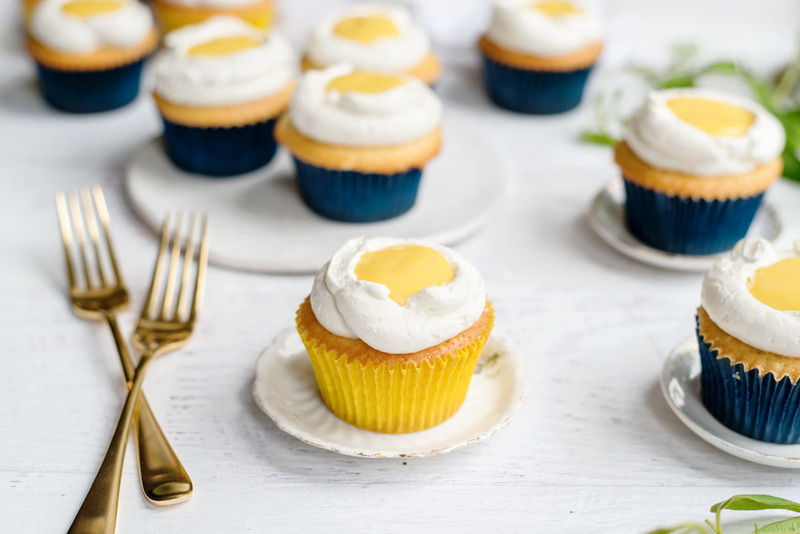 Another possible modification – the mango curd can be a bit runny, so you might want to stuff the cupcakes with a 1:1 ratio of mixed buttercream and curd. I did this with a second batch and we actually liked it better. After I got done making these cupcakes, I realized they looked familiar. Doesn’t it look like there is a sunny side up egg on top? It wasn’t intentional, but now I think they would be fun to include in some sort of themed party. I’m imagining a farm-themed birthday party for a bunch of kids, or even a breakfast party where all the breakfast foods are actually sweets! How fun would that be? There’s nothing like a trompe l’oeil dessert to put a smile on peoples’ faces. Thanks to you for reading A Side of Sweet! For more Sweet in your life, you can find me on Instagram, Pinterest, Facebook,YouTube, Bloglovin‘, Snapchat (@asideofsweet), or Twitter. You can also subscribe to receive a weekly email with new posts and random musings from me. Puree first 4 ingredients in processor, scraping down sides of work bowl occasionally. Add yolks; puree 15 seconds longer. Strain through sieve set over a large metal bowl, pressing on solids with back of a spatula to release as much puree as possible. Discard solids in sieve. Set metal bowl over a saucepan of simmering water (do not allow bottom of the bowl to touch water); whisk puree until thickened and thermometer registers 170°F, about 10 minutes. Remove from over water. Whisk in butter 1 piece at a time. Cover and chill. Bring a medium pot filled with one inch of simmering water to a boil. Place the egg whites and sugar in a stainless-steel bowl (like a stand mixer bowl). Use a whisk to beat the mixture until very hot (about 160F). Reduce speed to medium and add butter a few pieces at a time. Add the mango nectar and continue to beat until smooth and fluffy. Use an apple corer to gently hollow out the center of each cupcake, not going through the whole depth of the cupcake. Spoon mango curd into each cupcake. I like using an espresso spoon for this part! If the mango curd is too thin, you can mix in a bit of buttercream (about 1/3 c for 2/3 c of curd) before you fill the cupcakes. Pipe a large dollop of mango buttercream onto each cupcake with a large round piping tip. Press down the buttercream with the back of the spoon creating a shallow divot. Fill with mango curd. Hi, Kelly! 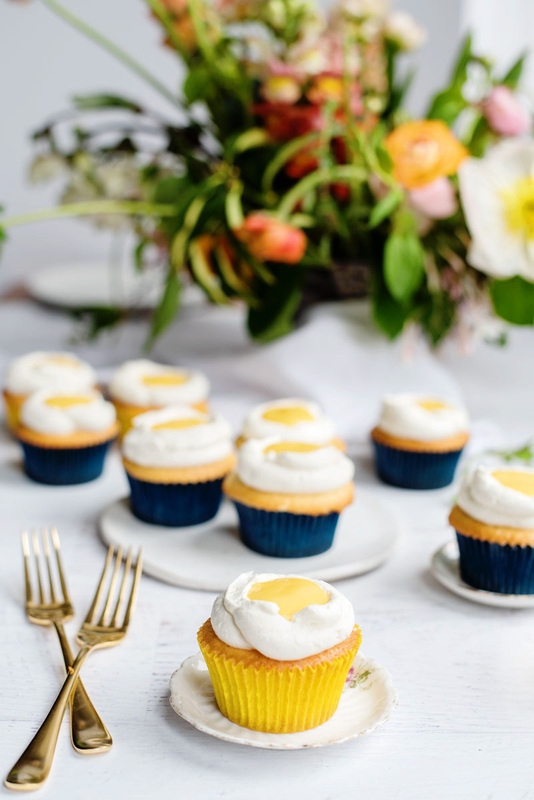 Beautiful cupcakes : ) May I ask how many egg yolks the mango curd calls for? I don’t see it in the recipe. 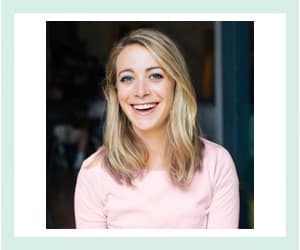 Hi Esther – So sorry about that! I switched recipe plugins a couple of weeks ago and some of my data isn’t showing up quite right. The recipe needs two egg yolks!